It has been shown that methods currently being used for measuring group delay in an antenna in an anechoic chamber are limited in precision due to the effect of residual reflections. A method has been developed to decrease the effect of reflections, with a linear approximation for the effect of a delay on the distance between antennas. The method is based on the assumption that the group delay between the input of the radiating antenna and the output of the receiving antenna in the far-field region depends linearly on the distance between antennas, and the interference caused by the residual reflections is of periodic nature. 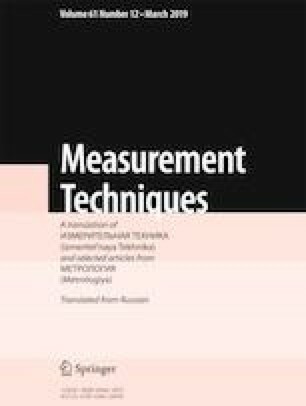 The method that was developed, compared with the method of determining the delay for a fixed distance that was used previously, made it possible to improve the precision of measurement by a factor of greater than 6. Translated from Izmeritel’naya Tekhnika, No. 12, pp. 47–50, December, 2018. Global Navigational Satellite System GLONASS. Interface Management Document. The Navigational RF Signal in the L1, L2 Ranges (ed. 5.1), Research Institute for Space Device Engineering, Moscow (2008), http://russianspacesystems.ru/wpcontent/uploads/2016/08/ICD_GLONASS_rus_v5.1.pdf, acc. 05.25.2018. B. B. Tian, Free Space VSWR Method for Anechoic Chamber Electromagnetic Performance Evaluation. MI Technologies, www.mitechnologies.com, acc. 05.20.2018.